Almost all of us have experienced a toothache. The pain and inconvenience often associated with a toothache is enough to really put a kink in your plans and your life. And while we’re always happy to help relieve toothache pain at my Douglasville dental office, a toothache can also strike on a weekend or at night when we aren’t open. 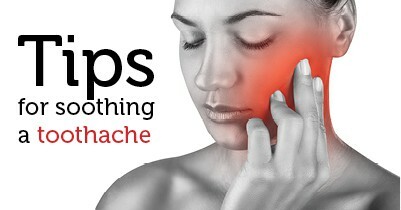 If this happens, here are some tips you can try to help ease the pain of a toothache. Before we launch into what is alright to use for a toothache, all of us at my Douglasville dental office feel strongly that we need to urge you to not try one common remedy. People often place Aspirin directly to the painful area. Don’t do this! Since Aspirin is an acid, it can burn your gums and cause greater harm to your mouth. If you’d like to use a pain reliever like Aspirin, just swallow it. Although these few tricks may help with your pain, it’s important to know that a toothache is your mouth’s way of telling you that something is not right. Please don’t ignore it! It’s never wise to assume that easing the pain is enough. In its early stages, a toothache could be the result of a minor dental problem that’s easily fixed by your Douglasville dentist. If let go, a simple problem can turn into something major and can even begin to affect the rest of your body. If you’re experiencing a toothache, don’t assume that it’s not a big deal and don’t let it go! Call my Douglasville dental office as soon as you can. We can help you determine what’s causing the pain and get it fixed for a healthy, pain-free smile. Are you a chronic teeth grinder? Not really sure if you are or not? It’s not surprising: of the roughly 30 million people teeth grinders out there, very few realize that they grind. A common reason could be that teeth grinding or clenching is often done either while sleeping or subconsciously throughout the day. And while it may not seem like a big problem, at my dental office in Douglasville, we consider tooth grinding a huge issue. Here’s why. Tooth grinding, or bruxism, can cause severe damage to your teeth and your mouth. Broken restorations and fillings, damaged teeth, lost enamel, and tooth sensitivity are only some of the problems associated with severe bruxism. Chronic tooth grinding or clenching can also lead to more serious problems like jaw dysfunction or temporomandibular disorder (TMD). This is what makes visiting your Douglasville dentist so important if you’re experiencing symptoms of being a bruxer. If you’re experiencing any of these symptoms, please call my Douglasville dental office as soon as you can. It’s important that you seek proper dental care if you are suffering from the pain associated with bruxism so we can diagnose your problem and determine how to properly treat you. At our dental office in Douglasville, we’ll examine your mouth, talk about what you’re experiencing, check your bite, and take x-rays of your jaw and mouth. An in-depth exam will allow us to see exactly what’s going on, determine how severe your bruxism is, and decide on the best way to treat it. Whatever your unique needs may be, my Douglasville dental office can help diagnose your bruxism and determine the best treatment for you. The pain associated with tooth grinding doesn’t need to be chronic. Give us a call today. It’s the first step to a better, pain-free smile. We all know that sugary drinks like soda aren’t the best for your smile. And in an attempt to avoid the sugar, calories, and caffeine in regular sodas, we often turn to diet soda to quench our thirst. However, at my Douglasville dental office, we want you to understand that even these sugar-free drinks can be just as bad, if not worse, for your teeth. 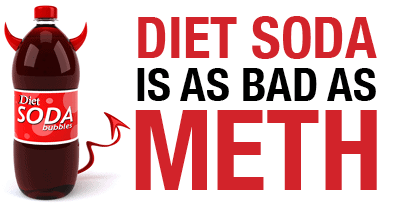 Soda, regular or diet, is highly acidic. And so are the ingredients in illegal drugs like methamphetamine and cocaine. The more food, drinks, or anything else with high amounts of acid that we put into our bodies, the more damage will be caused. Without tooth enamel, we’re more susceptible to cavities, sensitivity, discoloration, and damage. For this reason, I not only encourage everyone at my dental office in Douglasvilleto put the soda down and drink more water, but also to keep up with regular dental appointments. If you’re addicted to soda, already have damage caused by excessive intake of soda, or even have damage caused by past drug use, it’s time you see your dentist in Douglasville. We can monitor your habits and make recommendations on how you can get your smile healthy and looking the way you want it to. Cancer Diagnosis? See Your Dentist in Douglasville. Cancer is a scary word and a diagnosis none of us want to hear. 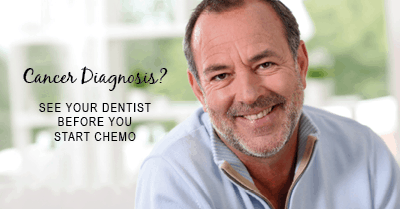 But if you or a loved one has been diagnosed with cancer, seeing your dentist in Douglasville before starting chemotherapy is a crucial step toward a successful treatment. While chemotherapy helps treat cancer, it also causes several side effects to the rest of your body, including your mouth. In fact, some of the oral health problems associated with chemotherapy can actually cause a delay or stop in treatment. Clearly, when you’re dealing with something as serious as cancer, it’s never ideal to stop treatment. This is why I recommend visiting my dental office in Douglasville at least one month prior to beginning chemotherapy. Your dentist in Douglasville is an important part of your cancer treatment and can help keep dangerous side effects away. Often times, the oral side effects from cancer treatment occur in unhealthy mouths, and while not all side effects can be avoided, the healthier your mouth is the more likely the side effects can be avoided and treatment can continue as planned. Ideally, it’s best to schedule an appointment at my Douglasville dental office one month before cancer treatment begins. If you or a loved one have been diagnosed with cancer please give my dental office in Douglasville a call as soon as you can. Our mission is to provide compassionate, quality care to allow for the most successful treatment possible.